The State of the Reformed Dutch Church in North America, About the Year 1765. Circumstances Relating to his Theological Studies, and to the Church of New-York. From the commencement of his studies in the University of Utrecht, till his return to New-York. From his return to New-York, till the close of the Revolutionary War. From the Resumption of his Pastoral Charge, at the Close of the Revolutionary War, till the Adoption of the Constitution of the Church, in 1792. From the Adoption of the Constitution of the Church, Till His Acceptance of the Call from New Brunswick. From his Removal to New-Brunswick, , Until His Death and Burial. 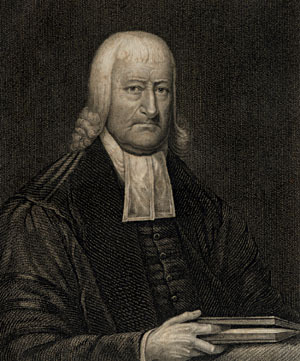 Born in 1746 in Poughkeepsie, New York, Reverend John Henry Livingston was the brother of Major Henry Livingston, Jr., the author of Night Before Christmas. Older by two years, John Henry was educated with Henry and their eldest brother Gilbert in the academy run by Rev. Chauncey Graham, a Congregational Minister, in Fishkill NY. 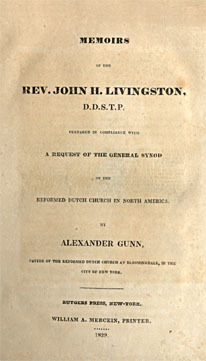 It was not uncommon for members of the Livingston family, themselves members of the Reformed Dutch Church, to be educated with Protestant ministers of similar faiths. John Henry's grandfather, another Gilbert Livingston, had studied with Rev. Solomon Stoddard of Northampton MA, the grandfather of Rev. Jonathan Edwards, though Gilbert changed his mind about a career in the ministry for himself. John Henry showed early educational promise, and was removed from Rev. Chauncey's academy at the age of 10 and privately tutored by Moss Kent, the father of NY Chancellor James Kent, before being sent to a preparatory school in Connecticut, which prepared him to enter Yale at the age of 12. He graduated Yale at the precocious age of 16. and began reading law under Bartholomew Crannell in Poughkeepsie. Forced by ill health to discontinue his studies, John Henry became drawn to religion and came to realize that his interests were with the church rather than the law. John Henry's ancestors were extremely well educated, many of them following a ministerial profession. His 2nd great grandfather, Rev. John Livingston, was an evangelistic minister, trained at the University of Glasgow, but escaping to Holland to avoid religious persecution. John Livingston's father was Reverend William Livingston, the first minister at Monybroch. On John Henry's Beekman side, two of his 4th great grandparents were Rev. Gerard Beekman, a distinguished theologian who was rewarded by King James I with a coat of arms for his services in translating the Bible into English. and Rev. William Baudertius, an intellectual leader and one of a handful of scholars selected to make the authorized translation of the Bible into Dutch. With the approval of John Henry's father, Henry Livingston, Sr., John Henry traveled to the Netherlands and began four years of studies at the University of Utrecht, receiving a Doctor of Divinity, as well as his Reformed Dutch ministerial papers. John Henry returned to New York and took up a ministry in the city. Coming from a solidly patriotic family, John Henry was forced to leave New York when the British took the city, and he moved further north with his new bride Sarah, the daughter of the Declaration of Independence signer Philip Livingston. A note: biographers seem to be mightily confused by the similar names that appear in the Livingston family. John Henry was NOT the brother of Governor William Livingston. John Henry married his 2nd cousin, Sarah Livingston, who was the daughter of Declaration signer Philip Livingston. It was Philip who was the brother of Governor William Livingston. To correct another frustrating Livingston mistake found all over the web and even in Wikipedia, John Henry's brother Henry was NOT Henry Beekman Livingston. Henry was the son of Henry Sr., who managed the property of his uncle, Colonel Henry Beekman. The young Henry Jr. would sometimes spend the winter in New York City staying at Colonel Beekman's home. Another frequent visitor to the Beekman home was Janet Livingston, Colonel Beekman's granddaughter. Janet Livingston married General Richard Montgomery. It was Janet Livingston's brother Henry who was the well known Henry Beekman Livingston! Even before the newly consecrated minister John Henry Livingston returned from Europe, he was already deep into planning how to repair a schism in the Reformed Dutch Church between those who wanted ministers trained up in America, and those who insisted that ministers only be trained in Holland. Though his goals were ambitious, the young minister succeeded, going on to participate in writing a constitution for the church, as well as creating an official book of Psalms and Hymns, which included a catechism to solidify the Reformed Dutch doctrines. With these credentials, John Henry was asked to create and lead a program for training ministers, becoming President of Queen's College, later Rutgers.